Don’t get me wrong: I’ve long been more than passing fond of heavy machinery and Victoriana, but I’m getting pretty bored of steampunk as an aesthetic – it’s just too damned ubiquitous right now, a fashionable marketing veneer. New wine in old bottles, you know. And few things sing out “steampunk!” quite so loud as the humble dirigible, of course – but there’s nothing to say that airships have to be a retro trope. So I suggest we reclaim the dirigible for near-future science fiction: witness this concept drawing from Australian aeronautics outfit Skylifter, which drags the dirigible bobbing and floating into the 21st Century… complete with 150 tonnes of cargo hanging beneath it [via SlashDot]. 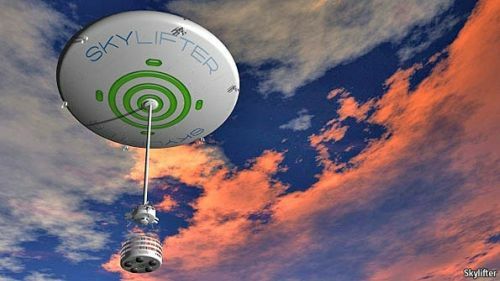 Rather than use either a spherical or a cigar-shaped aerostat, as the gas-filled envelope of a lighter-than-air craft is known, Skylifter has developed a discus-shaped one. This means that like a traditional, round ballon—and unlike the elongated dirigible blimps that have hitherto been used as serious modes of commercial transport—the craft is “directionless”. In other words, it is oblivious of where the wind happens to be blowing from, which simplifies load-handling in places where the wind is fickle. At the same time, being flatter than a sphere, the aerostat acts less like a sail than a traditional balloon does, making it easier to steer. The flying-saucer shape also acts as a parachute, affording greater control during descent. A Ukrainian airship visionary based in California has won further US military funding to develop his miraculous “Aeroscraft” sky-leviathan design. However, some question marks remain over the craft’s unique – almost miraculous – buoyancy-control technology. Well, not figuratively, anyway. Everyone knows* that wind is stronger the higher up you go, so why not get higher to make use of those high speeds? Well, constructing a 600-ft. base isn’t all that easy to do for one. 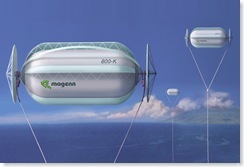 Enter the Magenn Air Rotos System (MARS), a giant sausage-shaped balloon fitted with rotors to generate power. It sounds like a wild idea, but other companies are developing similar technology as well. A small test version is currently underway, with hopes to build small-scale models for industrial use first, then building up to megawatt generators. Michael Marshall Smith’s excellent novel ‘Spares’ had a large section of its story set in a crashed flying mall, which previously had flown around the country for people to come up to and shop, eat and live. With airships beginning to come back into favour, the French aerospace research body ONERA has developed the design for a flying hotel called Manned Cloud. 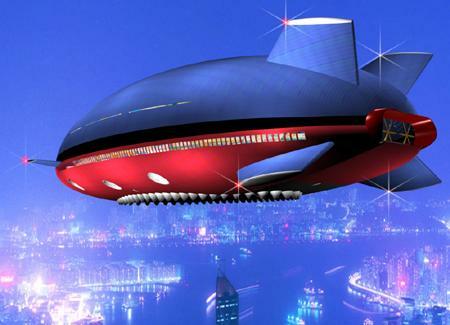 The whale-shaped dirigible would potentially house 40 guests and 15 crew with a range of 5000km. Although airships are less stable in high winds than planes, they also use a fraction of the fuel. Manned Cloud was designed by French designer Jean-Marie Massaud. This kind of sky cruise could be an important part of mid-21st Century travel and using airships for freight would also be very efficient. 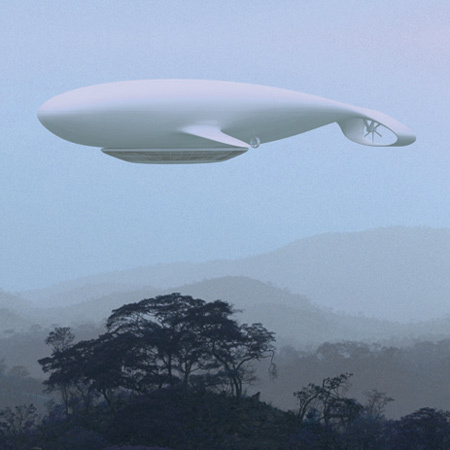 A new article by Air & Space Magazine hints at a return to airships, with a focus on their potential use for heavy lifting in military and commercial applications, as well as a use as a spy platform. That’s the idea, anyway. It remains to be seen if the necessary advances in technology will make these behemoths economically viable. One interesting feature would be that they might not come back in the familiar cigar shape – evidently a sphere is better for balancing out the helium. Another cool thing would be hover pads that could push or pull on the surface, either to keep the airship above the ground/ice/sea, or hold it down while cargo is being offloaded so it doesn’t shoot up into the air like a, well, balloon.